Deinonychus is a spectacular, but fairly small dinosaur. It measured about three and a half feet tall, and about nine feet long. Its weight is estimated at 150 pounds. By hunting in groups, members of a Deinonychus pack could have brought down dinosaurs much larger than themselves. 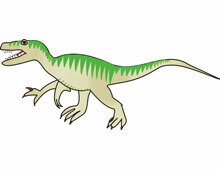 In fact, the bones of several individuals of Deinonychus have been found with the skeleton of a large plant eating dinosaur, called Tenontosaurus. Deinonychus belongs to a family of dinosaurs called dromaeosaurs. They all share the same characteristics a lightly built skull with sharp backwardly curved teeth, elongated arms and hands with sharp claws, and an extraordinary sickle-like second toe claw which was carried raised off the ground to protect the sharp point. Dromaeosaurs probably had keen vision and their brains were relatively large for a dinosaur. The dromaeosaurs lived throughout the Cretaceous period, 140 to 65 million years ago.